Feebates are most effective in achieving reductions in pollution. 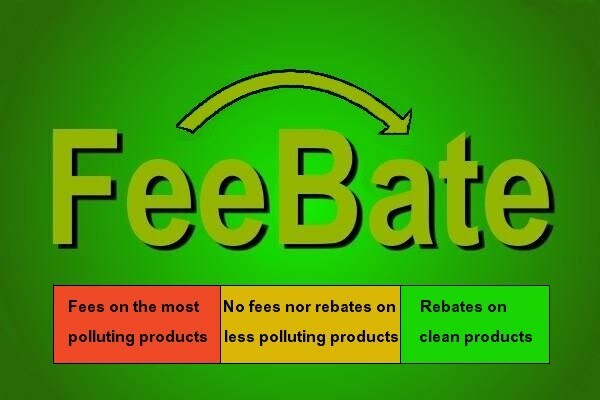 Feebates combine fees, imposed on polluting products, with rebates on corresponding non-polluting products. A framework of feebates is the key part part of a comprehensive plan of action to bring about a sustainable economy. Feebates should be considered as part of any comprehensive policy on global warming. Feebates can most effectively deal with carbon dioxide emissions and similar forms of pollution, due to the way feebates can be implemented. Ten advantages of feebates, as discussed below, jointly make that feebates are most effective in accomplishing a desired shift. Feebates can be implemented in a sector-by-sector approach, allowing feebates to be implemented in one sector without requiring similar programs to be in place in one or more other sectors. In other words, one feebate doesn' t need to to wait for another policy to be implemented first and there's little need for complex accounting to first work out how what happens in other sectors. Different feebates can each focus on a specific sector and thus be tailored to the characteristics of that sector. Each feebate works by imposing fees on polluting products in that sector, and then typically using the proceeds to exclusively fund rebates within that same sector, i.e. corresponding products that are not polluting. Over time, a number of sectorial feebates can grow into a framework of feebates that complement each other, reinforcing their joint impact. Similarly, feebates can be implemented locally; in fact, feebates are best implemented locally, i.e. with fees imposed on consumption of polluting products, while proceeds fund rebates on clean products in that same area. This allows each area to select what they regard as the most suitable policies in their area, and change policies as circumstances change. Feebates can thus be implemented locally without a need for similar programs to be in place elsewhere. Again, there is little need for complex accounting to first work out what happens elsewhere. A benefit associated with its local focus is that such a feebate can be implemented immediately. Feebates can be implemented by local communities without having to wait for measures adopted elsewhere. While international agreements may help back up a global commitment to reduce pollution, feebates can be implemented locally even while such an agreements are still lacking. Feebates are most effective in achieving the necessary shifts, since feebates provide both (additional) financial incentives and disincentives. If a country only used taxation, the entire shift will have to be accomplished through, say, carbon taxes, so these taxes will have to be higher than the fees would be in case of feebates. Thus, feebates can avoid leakage, such as when people go across the border to buy products (e.g. gasoline). Fees are imposed where the products are sold, which doesn't make business move across the border to avoid fees. If needed, customs fees can be added at the border where products are bought abroad directly by consumers (rather than through an importer), but the more countries implement feebates, the less need there will be for such fees. Since feebates can be self-financing (see 8. ), they don't put an extra burden onto government budgets like subsidies would do. Feebates actually reduce the need for other policies, such as subsidies, thus bringing relief to government budgets. Of course, governments can still decide to subsidize specific manufacturers if they want to (besides implementing feebates). But with feebates in place, there is less need for governments to subsidize specific manufacturers, as rebates can act even more effectively than subsidies, since rebates apply only to products that are actually sold. A feebate can have a single borderline, thus creating two categories, i.e. one category of products where fees apply and another category of products where rebates apply. This works like a pivot point. Eligible products on one side of the border receive rebates, to be funded from the proceeds of fees imposed on products that are on the other side of the borderline. This type of feebate is pictured below. Such a feebate effectively works like a standard, as pictured below, be it that standards lack the financial clout of feebates. Standards work well where specific products carry unacceptable safety risks and thus need to be taken off the market immediately. Feebates, on the other hand, facilitate a shift to cleaner products by imposing fees on sales of polluting products, and at the same time using the revenues of such fees to fund rebates on clean alternatives. By having two borderlines, as illustrated on the image below, a feebate can create three categories of products. One category contains the most polluting ones that will attract fees, and another category contains clean products that will be eligible for rebates, as before. Additionally, there is a category in between for products that are neither particularly polluting nor particularly clean. Standards typically result in only relatively small changes, without achieving larger, more radical shifts. Once they comply with the standard, manufacturers have little or no (dis)incentive to do more. Feebates, on the other hand, can be more effective in facilitating more dramatic shifts, as they can use multiple categories and can offer financial incentives to manufacturers and suppliers that go much further. Feebates can achieve such shifts gradually, allowing manufacturers time to adjust their products, as feebates use financial instruments and market mechanisms, rather than the legal mandates that come with standards. 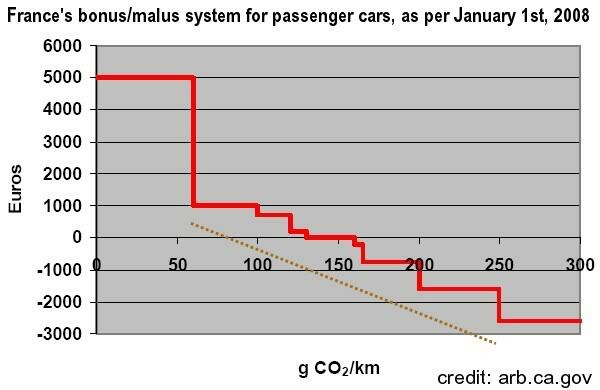 This is especially the case for feebates that use many categories, as illustrated below in France's bonus/malus system that discourages polluting cars and rewards cleaner cars, based on grams of CO2/km. Such incremental steps make sense where gradual improvements are aimed for, such as in fuel economy. Linear systems that use either straight or curved lines may be even more economic than such incremental steps, a study (URL in image below) says, since steps can make consumers prefer a product that is only minimally cleaner, yet financially a lot more attractive, as it just happens to fall in a better category. Big jumps between categories can make manufacturers adjust their product only to make it fall without the desired category, even if such adjustments come at high costs. 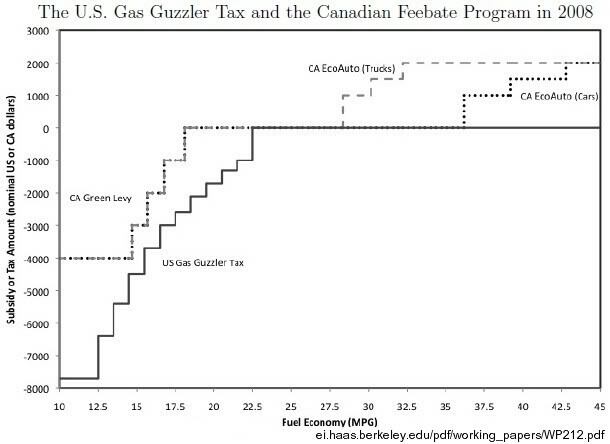 To illustrate this, the study looks at the U.S. tax and Canadian feebate programs shown below. Technically, a system that uses categories could act as a linear system: using numerous categories with relatively small changes between them would make it look like a linear system. However, there are two reasons to stick to categories. Firstly, categories have the advantage that they can be easily used on labels, quickly showing potential buyers which one is the cleanest car, e.g. the one rated A versus the one rated B, as opposed to numbers that are more difficult to remember when buyers go from one car-dealer to another. Labels that give cars a number of stars can also work well, especially if color is added to indicate differences. Secondly, categories may be more practical when aiming to achieve not just improvements within one technology (e.g. fuel efficiency), but rather a shift to different technologies, such as from internal combustion engines to electric motors and batteries, supercapacitors, fuel cells, etc. Categories allow policymakers to simply state that eligible vehicles must use a specific technology, e.g. carry batteries or fuel cells with a specified minimum capacity. Another advantage of feebates is the versatility in the ways they can be implemented. The most well-know feebates are car feebates, relating to sales and registration of vehicles, with fees and rebates reflecting their expected emissions. In such feebates, the proceeds of fees on polluting vehicles would fund relief of such fees for clean vehicles. Apart from funding rebates on cars, the revenues of fees on polluting cars and transport fuels could also be used to fund programs that subsidize EV batteries or other ways to clean up local transport. Similarly, fees on gasoline could be used to help either local clean energy or transport electrification programs, or both. Feebates can be implemented in many different ways, allowing them to be tailored to local conditions and needs. While each feebate can be implemented separately, feebates typically work in a complementary way, i.e. one feebate can help another feebate becoming more successful. As an example, industry may be reluctant to switch to electric arc furnaces in metal smelting, arguing that it was more efficient to burn coal directly in blast furnaces than to burn coal in power plants first and then bring the resulting electricity to electric arc furnaces. But as other feebates facilitate the shift from fossil fuel to clean ways of producing electricity, it makes more and more sense to shift from the traditional blast furnaces to electric arc furnaces. Similarly, they may consider using hydrogen for heating, as the cost of hydrogen comes down dues to other feebates. Furthermore, feebates can be implemented in addition to other policies. Currently, all countries regulate waste handling and many practices are simply prohibited. Technically, feebates could replace such prohibition, since fees could simply be set prohibitively high. Nonetheless, feebates could also complement such prohibition, by imposing fees on the dirtiest products allowed by law, while using the revenues to fund clean alternatives. Feebates can be self-financing, in which case they are - from the perspective of government - budget neutral. This can make it easier to introduce them, as governments don't need to make changes to existing budgets. Feebates can be implemented in budget-neutral ways, making such implementation more acceptable than subsidies that would come at the expense of other funding elsewhere. Feebates can avoid the emergence of bureaucracies administering the policies. A feebate policy only needs to identify polluting products and insist that the alternatives - to be eligible for rebates - are safe and clean; market mechanisms can further sort out what works best where. Furthermore, feebates can be implemented through existing channels. No complex bureaucratic apparatus is needed to implement feebates. A simple percentage added to the sales price of polluting products can fund rebates that are set, say, on an annual basis. Registration fees, levies, sales taxes, value added taxes and G.S.T. (goods and services taxes) are commonly used around the world, and so are grants, subsidies, vouchers, pensions and rebates. Fees and rebates would merely be added on top of systems that are already in place and have proven to work. Therefore, the extra administrative work required to implement feebates is minimal. Local implementation, i.e. applying feebates to a specific area only, makes it easier to follow money trails and check things out. This in contrast to offset schemes and cap-and-trade schemes where money could disappear to countries where rogue traders claim things that are hard to verify. When feebates are implemented locally, fees can be collected through existing local channels and agencies, such as those currently used to collect sales taxes, car registration fees or council rates. Similarly, rebates are given to the cleaner products sold locally, making it easier to verify that those products were indeed cleaner and that they were sold locally. Nonetheless, to ensure that the revenues of fees are indeed used for the intended purposes, it makes sense to set up a local Feebate Fund in the area where the fees were collected. Fees on the most polluting products can be set to reflect the amount of emissions or pollution they can be expected to cause, but even simpler is to set fees as a percentage of the sales price. Imposing fees on polluting products where they are consumed (and thus cause the emissions) avoids complex international negotiations and calculations regarding emissions. Similarly, rebates can be set as a percentage of the sales price of clean alternatives. Progress can simply be measured by the decrease in emissions that occurs within the local area and sector targeted by the feebate, and the height of the fees can be adjusted accordingly. As the shift progresses to more desirable products, the polluting product becomes ever less popular.This means that feebates can phase themselves out, having achieved their purpose. Eventually, the polluting may disappear from the market entirely, resulting in no further revenues being raised. Effectively, that would mean that the feebate has phased itself out, with minimal risks of leaving a legacy of a bureaucracy that seeks to perpetuate itself by raising further fees for the sake of prolonging its own existence. 6. fees on conventional industrial processes, funding processes that are powered by electricity and that incorporate carbon in the end products. Metal, concrete, glass and other building materials can all be produced in cleaner ways. Concrete can be made in a number of cleaner ways, as described in carbon negative building. 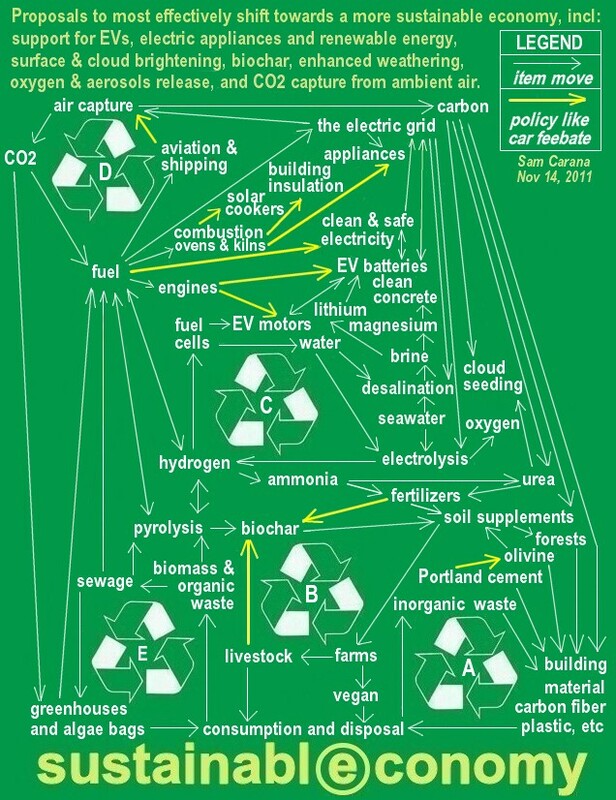 In conclusion, a framework of feebates, such as pictured in the diagram below by means of the yellow arrows, is the key to a sustainable economy.